Dr. Thomas Tarter, Urologic Oncologist at Cancer Care Specialists of Illinois, now offers a SpaceOAR procedure to protect prostate cancer patients from the negative effects of radiation therapy. The SpaceOAR procedure is performed in office by Dr. Tarter at the Cancer Care Center of Decatur. The procedure is available to all Urologic Oncologists, Clinics and Hospitals to protect their patients before undergoing radiation therapy for prostate cancer at their respective locations. To find out if SpaceOAR is right for you, talk to your radiation doctor and schedule an appointment with Dr. Tarter. Dr. Tarter performs the SpaceOAR procedure before radiation therapy begins. Following the procedure, all radiation therapy is managed by your radiation doctor. 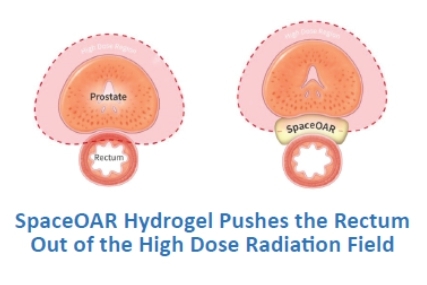 To learn more about SpaceOAR hydrogel please see the Frequently Asked Questions (FAQ) Patient Guide. For more information on SpaceOAR system go to http://www.spaceoar.com. SpaceOAR® is a Registered Trademark of Augmenix, Inc. Images, animations and graphics are used with permission from Augmenix, Inc.